Welcome to Agritourism Vocabolo Palazzo by Guidarello Mencarelli placed in the tiny Middle Age hamlet of Solomeo, surrounded by the green areas of the Umbrian countryside. 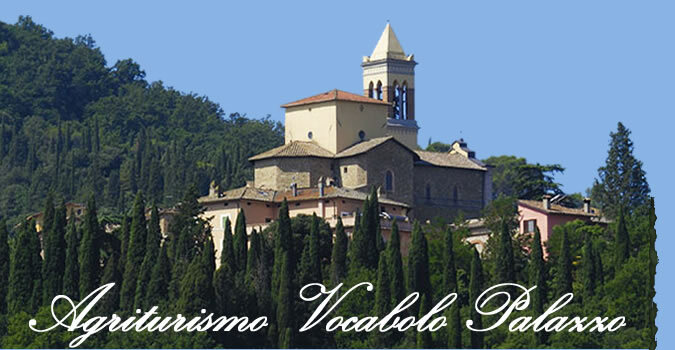 Its strategic location, not far from the most important communication links as well as the arterial roads of the region, makes the property an important point to visit the most impressive Umbrian villages and towns such as Perugia (4 km), the Trasimeno Lake, Assisi (20 km about), Deruta, Todi, Orvieto, Spello, Gubbio, Trevi, Montefalco, Spoleto, Norcia, Cascia, Città della Pieve, Corciano and so on. The property is a 18th -century three-level building completely refurbished, equipped with a lift offering comfort and hospitality in its 15 fully -equipped bedrooms (bathroom, telephone, television and heating). The restaurant is based on the typical Umbrian food under the owner's supervision as a reflection of the family-run atmosphere. The service is individual upon reservation; breakfast is included in the prices of the room. The presence of a wide solarium lets our guests to relax and to enjoy a marvellous view as well. The surrounding park allows you to go out for long walks with your pets- a special place is reserved to them. The property is also suitable for the disabled allowing them an easier access to the whole structure and its facilities. Mastercard, Visa and all major credit cards are accepted.